There have been many fans of the Apple iPhone that have stated that they will be waiting until next year before purchasing a new handset as many believe that it will be in 2014 that we see the most changes to the device, and the iPhone 6 design with have for you today is more futuristic. 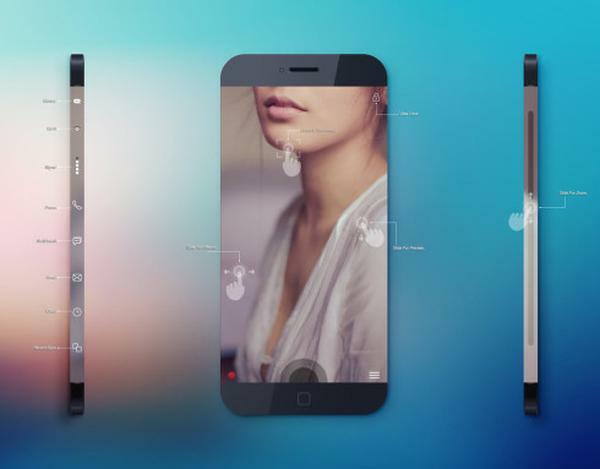 Some users were a little unmoved with the new smartphones that Apple released a few weeks ago and have decided to wait for the release of the iPhone 6, and the concept phone idea we have for you today maybe more up their street. There has been many rumours suggesting that Apple will again increase the screen size of the device with the iPhone 6 with many hoping for something around the 4.8-inch to 5-inch mark. The design that you can see on this page features an edge to edge display and there is also a view lock that has been provided so users can capture video in a number of angles. Users can also focus and zoom with a quick slide of the finger and going down the sides of the device are the controls for the device on the extended wrap around display. The smartphone is built using new materials such as magnesium and an all new glass protecting the display, and powering the device is the next gen of Apple processor. We also have 64GB of internal storage and the fingerprint scanner with Touch ID has been ditched in favour for an eye scanner which is something that Samsung is rumoured to already be working on for next year.